Re-Learning To Teach: Day 18: Rectangle? Damn Near KILLTANGLE! After how well the rectangle talk went with the pair of students yesterday, I decided to scale it up to the class. My students (and every student I have ever encountered) have tremendous difficulty understanding the concept of fractions and the work of manipulating them. Last year, I was introduced to the work that Fawn does with rectangles and I embraced it whole-heartedly. "We had a party this weekend and it was awesome! We ordered some pizzas from a few different places. At this party, Ki-Shawn eats 3 slices of pizza and William eats 2 slices. Who ate more pizza?" 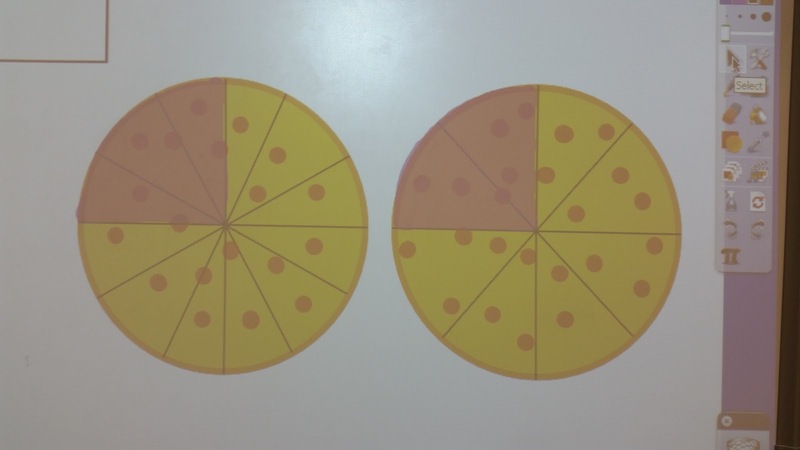 It seems like a simple question, but I keep the discussion going until a students points out that they might be different sized slices, so just knowing the number of slices isn't enough for us to tell who ate more. So I lay out some more information. We ordered 2 large pizzas, but they came from two different places. One place cuts their pizza into 8 slices while the other cuts theirs into 12. The students can see that they ate the same amount of pizza even though they ate a different number of slices. 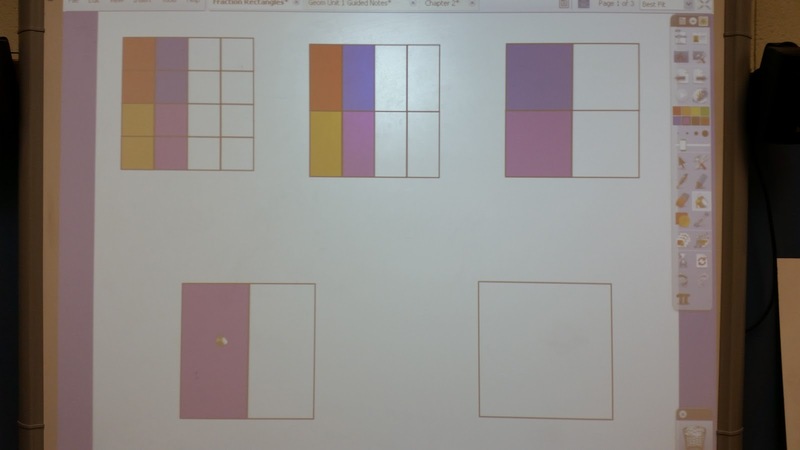 This leads into equivalent fractions and how, if we want to talk about slices of things, we need to those slices to be the same size. Today, a student suggested that we slice the pizza slices up smaller so they are all the same size. S: "We could cut the bigger slices into 3 and the smaller slices into 2 each. Then they'd be the same size." AMAZING! This let us go right through to where I wanted to be! We did several examples of this process. I was hoping they would catch it sooner so we could do some activity on the vertical non-permanent surfaces, but they were highly engaged and asking good questions for clarification. 8th period decided to spend some time looking up answers to our #Estimation180 warm-ups so 9 kids knew exactly what the answers were. I gave a long rambling talk about having multiple lottery winners from the same town and how that indicates cheating. When I was tired of being yelled over, I handed out a worksheet and told them I would be sitting at a back table working with anyone who wanted help. Several students flocked over and anyone who came to ask a question was invited to sit and join us. 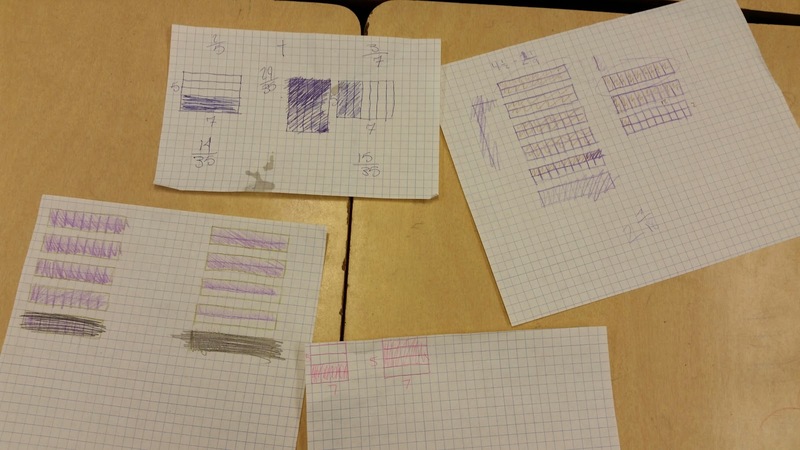 By the end of the period I had almost a dozen students sitting around me with graph paper and white boards working on adding and subtracting fractions. I'm pleased with the lesson and will continue it tomorrow. 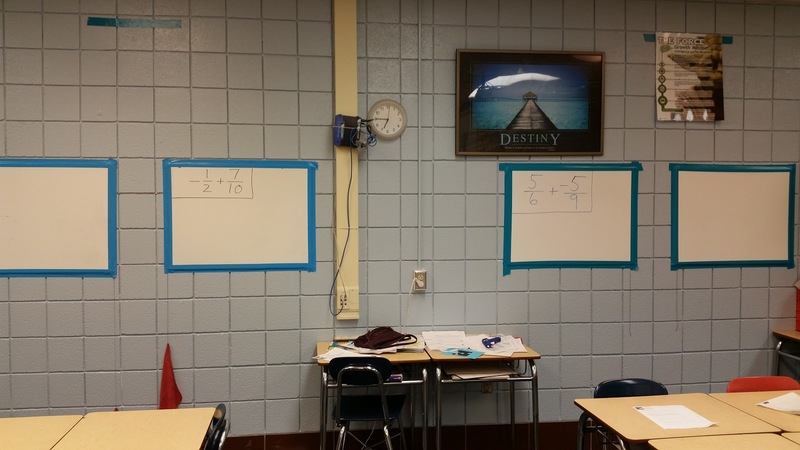 My fraction questions are up on whiteboards around the room. The plan is to have them do the work and then go hang their answers, creating a gallery walk. I think it should be a good time!